Jim Campanis Jr. is real. He’s not a wise-cracking TV commentator. He’s not the graduate student showing off with endless thesis-filling sentences. Instead, he’s a grateful, honest (and big-time funny) baseball storyteller. Fans and collectors alike will be amazed at Jim’s new book, Born into Baseball: Laughter and Heartbreak at the Edge of the Show (Summer Game Books). He’s part of a three-generation baseball family. Dad Jim Sr. played for the Dodgers, Royals and Pirates from 1966-73. Grandpa Al spent a career with the Dodgers, progressing from player to scouting director to general manager, until a 1987 controversy led to his departure. 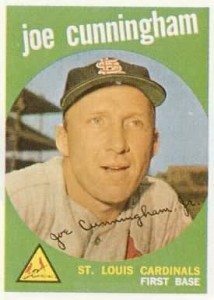 Yes, Jim discusses everyone and everything, including his view of the infamous ABC Nightline interview that falsely painted Al Campanis as a racist. 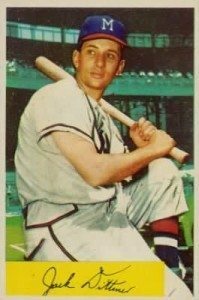 No one considered, Jim adds, that his grandpa roomed with Jackie Robinson in the 1940s. Al Campanis signed Latin stars, from Roberto Clemente to Pedro Guerrero. “His only prejudice was against lousy baseball players…of all races!” Jim writes. Grandpa Al gave grandson Jim his first taste of fame at age nine. Al’s instructional book for kids, Play Ball with Roger the Dodger, featured illustrations by Syd Hoff, known most for Danny and the Dinosaur. Hoff’s artwork was based on many photos of nine-year-old Jim modeling proper baseball techniques. Several surprises in Born Into Baseball may stun collectors. 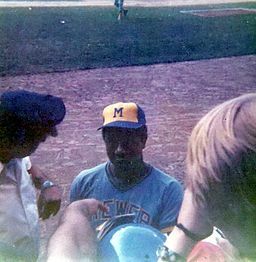 Jim tells about how asking for autographs in the clubhouse was taboo, but the player’s son broke the rule to get a baseball signed by Hank Aaron. Jim tells why the ball did not survive his childhood in mint condition. Jim rocks the tale of how a Pirates jersey he sold to a dealer (for $150) happened to be one worn by new Hall of Famer Willie Stargell. The relic, collected by dad during his Pittsburgh affiliation, financed Jim’s high school prom evening. Jim thought he found just another old jersey of dad’s. One unhappy dad, by the way! Jim reveals his run-ins with baseball card companies. Upper Deck is his least favorite. He tells all. The second half of the book is stuffed full of baseball secrets. Such as? Jim was tutored on framing pitches and stealing strikes from none other than Bob Boone. The toils of being a pro player are included in the book. While Jim Sr. moved 43 times in his career, his son counts “only” 25 new addresses. The worst stadiums, the drunkest fans. Jim gives peeks at his discoveries that would be worthy of a Bull Durham sequel. Yes, Jim’s parallels to the movie are many, even getting married on the field in 1991. The book ends with two poignant chapters. In a baseball equivalent to Brian’s Song, Jim remembers his best friend at USC, teammate and roommate Dave “Lats” Latter. 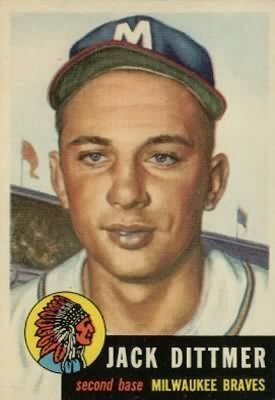 A fine finale to Born Into Baseball comes from Jim describing his “bitter period.” After his minor league career was over, he couldn’t bear even watching a game on TV. The “why them? Why not me?” factor was overwhelming as he mourned the death of a dream: wanting to be a major leaguer. Jim concludes with how he was redeemed. Not as a baseball player, but as a baseball fan. The book is an all-star tour through a three-generation baseball family. Seattle may not have called Jim up. However, baseball bookshelves everywhere will promote him. 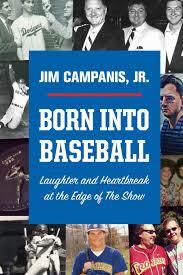 Jim Campanis Jr. is a major league author. What might be the best part about Born Into Baseball? Find the book’s Facebook page, or check out the website. Jim is adding autographed “bookmarkers” with each copy sold through his website. Order from his website and get (while supplies last) autographed photos of dad’s three Topps cards (1968, 1970 and 1974 Topps), a signed game photo of Jim catching future major leaguer Jeff Darwin, and a facsimile autographed photo of a 1943 Brooklyn Dodger player. I have a new site, a site that’s just begun. I have yet to fill in the Frequently Asked Questions section. I have an idea of the most-often-asked questions I get from readers, including newcomers. I deal with through the mail (TTM) interactions. Many of you seek autographs. Others (like me) are looking for more from baseball’s past and present: an answered question, note or memory shared. Readers, I’d be so grateful to see your top tips and suggestions. I want to offer an FAQ section to help keep our hobby thriving. Help me help them! Iowa lost a part of baseball history in the death of 86-year-old Jack Dittmer this week. I enjoyed the letter he shared in 2011. The super signer kept in touch with teammate Hank Aaron years after his retirement. I liked the last line in the obituary to the Cedar Rapids Gazette that Dittmer’s family provided. I hope you will, too.